In the 1960s, Hong Kong had a pen manufacturer by the name of Rox Industrial (樂士實業), which made a variety of writing instruments including ballpoint pens, fountain pens, markers, sign pens and mechanical pencils. 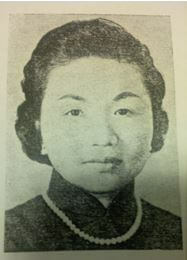 Although Rox focused on the export market, the firm was known locally as it did have a presence at the CMA HK Product Expo during this period and also because its proprietor, Holia Hsing Chow (周邢禾麗 1922-2011), distinguished herself as one of the few pioneering female industrialists in Hong Kong at the time. In addition to running Rox, Holia was also a mother of seven and served as director and secretary of another family business – Lucky Enamelware. Holia achieved early fame in wartime Shanghai as a novelist and her own saga from Shanghai to Hong Kong and Vancouver certainly reads like a novel. Holia Chow was born Hsing Nien-chun (邢念椿) and was a native of Changsho (常熟) in Kiangsu province. Her father died when she was young and she was raised by her mother. She studied Chinese literature at two of the most prestigious Christian colleges in Republican era China – first at Soochow University in Suzhou, then at St John’s University in Shanghai. During that time Shanghai was under Japanese occupation and Holia was amongst a number of college age female writers who rose to prominence in a popular literature genre known as “Mandarin Ducks and Butterflies Fiction” which primarily deals with relationship issues in an urban society. Although she was lesser known and less prolific than some of her contemporaries such as the influential Eileen Chang (張愛玲, 1920-1995), a number of her works of fiction were published in popular literary magazines such as Phenomena Monthly (萬象), whose editor the famous lyricist Chen Dieyi (陳蝶衣, 1907-2007) held her in high regard and in recent years her works have been re-discovered by a new generation of literary scholars. Holia’s personal life took an interesting turn as it was arranged that she marry Hou Ta-chun (后大椿), a fairly senior official in the puppet regime of Wang Ching-wei who was in charge of food supplies. In early 1944, Hou was arrested for corruption charges and subsequently executed. 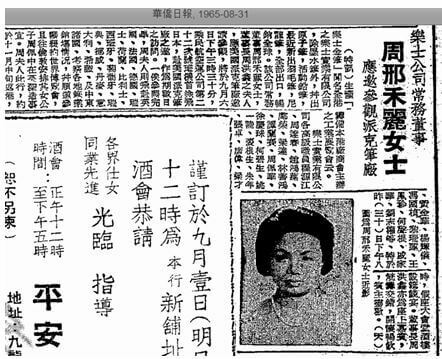 Holia was not a young widow for long as on May 15, 1945, she married Chow Horng-shing (周洪鑫, aka Chow Yuk-ying 周毓英), the brother of Chow Yuk-ho, a leading figure in the enamelware industry in Shanghai associated with I-Feng Enamelling. The Chow family soon moved to Hong Kong where they established Lucky Enamelware as one of the leading enamel factories in the colony. Holia was involved in the management of the firm, successfully making the transition from author/housewife to businesswoman. 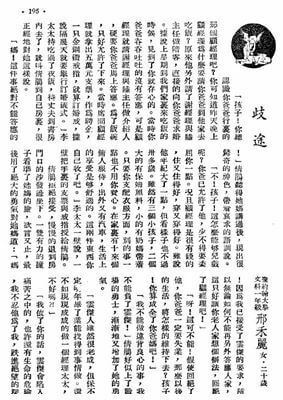 Excerpt of a novel by Holia Chow published in Phenomena Monthly in wartime Shanghai when she was a 20 year old student at SJU in Shanghai. In 1957, Chow Yuk-ho passed away and his children inherited his shares and leadership role at Lucky. While Holia and her husband remained involved in Lucky, they opted to start their own industrial venture and in 1959 incorporated Rox Industrial to manufacture pens. While her husband was chairman, it was Holia as permanent managing director who ran the day to day operations of Rox. The firm’s products were primarily exported overseas to many countries in Asia, Continental Europe, the Middle East, Central and South America, the UK and the farthest corners of the British Commonwealth including Australia and West Africa. In addition to its Feather Sign pen brand and Roxor brand of nylon tip markers, fountain and ballpoint pens, it also made other products such as Rox plasticware, Victory toys and Holia cosmetics. The original factory was located at 23 Hung Fook Street in To Kwa Wan in the late 1950s but later moved to 25-27 Tai Yau Street in San Po Kong in the 1960s where it was capable of churning out 30,000 dozen fountain pens a month. Holia was involved with the CMA as the head of its stationary sub-committee and she was also an active member of the HK General Chamber of Commerce. And given the global nature of her clientele, she travelled extensively including a two and a half month long trip to the US, Europe and the Middle East in 1965. In 1973, Rox Industrial was dissolved and Holia migrated to Vancouver, Canada with her family. In her retirement years, she remained active with the local chapter of the St John’s University Alumni Association (SJUAA) and thanks to her efforts and those of her fellow classmates such as T.F. Ying of Smart Shirts, St. John’s College was established at the University of British Columbia in 1997 to continue the legacy of her alma mater. 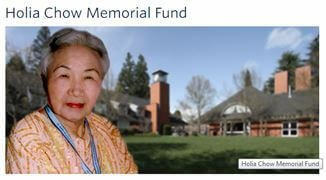 After she passed away in 2011, a memorial fund was established in her name at the college. For details about Lucky Enamelware, see separate article on Shanghainese Enamelware Makers in Hong Kong.